There’s nothing like watching an event in person but, for many modern consumers, livestreaming is the next best thing. And for marketers, it may just be the next big thing. Since their release in early 2015, apps like Periscope and Meerkat have generated a ton of hype. It can even be stated that they have single-handedly created the live streaming trend on social media. It took Periscope four months to amass 10 million users who collectively stream 40 years of video a day. Today, the social network giants are the primary choice of many, when it comes to live video. What’s so great about livestreaming? Livestreaming provides a whole new level of connection between brands and their fans. If Snapchat allows viewers to candidly look back at your recent activities, livestreaming gives them a chance to watch them unfold as they happen. They can interact with you in real time. Pose questions. Make requests. Provide feedback. It’s the closest thing to an actual face-to-face dialogue, and that’s powerful. Plus, the industry is still in its infancy. By starting now, you’ll be tapping into a fast-growing market. First-mover advantage, anyone? On the other hand, the downside of livestreaming is that anything can go wrong at anytime. It can be a frightening prospect, but that comes with the spontaneity of it all. You’ll need to be ready to put out fires as they happen. Some extra thoughtful planning makes this less of a concern. What do you need to start streaming? Good news! The only equipment you’ll need to start streaming is a smartphone and enough storage to install a livestreaming app. In fact, most social media apps already allow you to livestream directly without the need of additional downloads. This low barrier to entry is probably one of the key reasons why it’s taking off so quickly. Everything else comes down to having a good idea and putting together the framework to execute it properly. Which livestreaming service should you choose? There are a number of livestreaming services available at the moment, each with their own set of advantages. We’ll touch on some of the most talked-about competitors below. As with any product in the Zuckerberg stable, Facebook Live has a lot of potential – one live Q&A with Vin Diesel reached one million users and other celebs are reaching audiences of 200,000 or more. Until recently, however, only verified celebrities and public figures could broadcast using the service. That’s all about to change. Facebook announced last week that Live is now rolling out to US iPhone users, with the rest of the world to follow. Android support is in the works too. Clearly, this is a massive development in the world of livestreaming. You can check out the teaser video here. Users start streaming from the Update Status section by selecting the Live Video icon, where they will be prompted to add a description and choose their audience. When the stream starts, they’ll be able to see how many viewers they have, the names of their friends watching, as well as a live feed of comments that can be liked in real-time. Once it’s wrapped up, it will automatically be saved as a video to their Timeline. Facebook Live proved to be a major way to share and promote your brand and content online. Today, the social network is even aimed to compete with platforms such as YouTube gaming and Twitch, to deliver live video streaming of gaming and eSports content, directly on their platform. Following the footsteps of Facebook, Instagram also has a live streaming feature integrated directly in its mobile app. After the introduction of stories, an idea Instagram took from Snapchat, the social network for visual sharing added live streaming to the mix. Easy to use, combined with a feature people already use, livestreaming on Instagram does prove to be a worthy competitor to Facebook Live. On the plus side, live videos are promoted on the trending page and on the stories top post hashtag. On the negative, Instagram doesn’t let you retain your live video as a post. Of course, there are story highlights, but it is still not the same as the official posts on a profile. In 2017, LinkedIn also introduced new video streaming features to its platform. The network aimed at connecting professionals with each other is still dipping its toes in video services. They have recently introduced video playback overall and it is still early to tell the direction in which the content of the platform is headed. However, in 2017, the social network started testing live video streaming allowing 500 influencers to check it out. LinkedIn is not the first choice for every brand. While a powerful social network, digital marketers are still finding ways to get the most out of the platform. When will live streaming hit the platform and will it make it a more lucrative option for brands? It is still early to tell. What about the original livestreaming services? Of course, we also need to take a look at the platforms that started the live streaming trend – Periscope and Meerkat. Twitter’s Periscope is currently leading the pack of livestreaming apps. Right off the bat, it links easily to your Twitter account and allows you to quickly follow anyone you’re already connected with. Their trending section is another great way to find popular ‘scopers’ to follow. Broadcasting itself is fairly straightforward and uses your phone’s camera. You have the option to automatically send a Tweet whenever you start streaming, and anyone following you gets a push notification unless they opt out in the settings. Once you’re live, your audience can comment and add hearts (the equivalent of a ‘like’), making the whole experience very interactive. Upon finishing your broadcast, your video is available to replay for the next 24 hours and can also be saved to your phone’s camera roll. Meerkat – Periscope’s chief rival – is similar in functionality but is determined to set itself apart with the addition of some innovative new features. Their ‘Cameo’ feature lets one of your viewers take over your broadcast for up to 60 seconds, allowing you to get really creative with how you interact with fans. Meerkat also integrates with GoPro cameras, an excellent feature which considerably increases the possibilities of what you can stream. Though the app won’t connect to your Twitter profile (a result of its competition with Periscope), you have the option to link your Facebook account and be notified whenever your Facebook friends or pages you follow start or watch streams. For all its innovation, however, Meerkat has struggled to pull in traffic since Periscope hit the market. Another thing to consider is its lack of a replay function, which is disappointing news for anyone who missed your stream. Each app offers something unique and it will ultimately depend on your needs but, for now, Facebook Live appears to be the most promising option for brands. It taps into your existing following, ensuring that you will be able to maximize your reach. That isn’t to say Periscope and Meerkat can’t come back. Plus, with their host of nifty features, it may be the better choice for brands with specific creative needs. Then there’s LinkedIn Live Streaming. It’s still in its infancy, but when it’s rolled out to LinkedIn’s entire user base we’re willing to bet it will be a force to be reckoned with. There’s no limit to what you can stream. 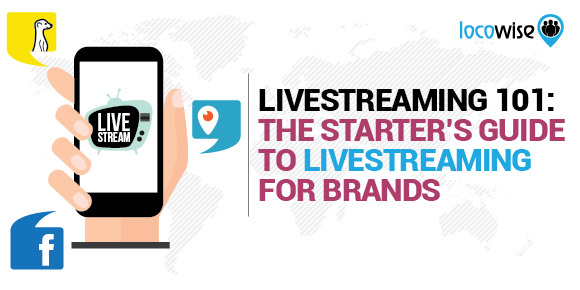 A number of brands have already thought of some pretty novel ways to utilize livestreaming. It all comes down to what you want to convey to your viewers, but here are a few pointers and ideas to get the creative juices flowing. • Why not use a Twitter poll and ask your fans what they want to see? • Try to do something that your audience can participate in. A live contest fits the bill perfectly. • Behind-the-scenes content shows your fans a different side of your business. • Team up with influencers. Periscope and Meerkat have their own stars with impressive follower counts. Or why not partner up with an existing Youtube or Vine star like Wendy’s did? • Livestreaming provides a direct link between you and your audience, making it perfect for Q&A’s. • If you’re throwing an event, extend a virtual invitation to your fans that can’t be there in person. Above all, strive to be creative and come up with something that people will really engage with. The sky’s the limit. Having an interesting concept is the best way to keep a viewer tuned in. Just bear in mind that anything can happen in a livestream – there is no post-editing, so stay on your toes! And if you need some further inspiration, make sure to visit our 20 live video ideas post as well. How can you promote your livestream? When the time comes for you to plan your first stream, you’ll want to make sure all of your fans know about it ahead of time. This is where your other social media profiles come into play. We mentioned earlier that Periscope gives you the option to automatically send a tweet whenever you start broadcasting. That’s great and you should absolutely take advantage of this feature, but you’ll reach the most people if you start promoting your stream at least 24 hours in advance. Remember, the stream is live, and even with Periscope’s replay function it will only stay on the platform for an additional 24 hours. Fans watching the replay won’t be able to add their own comments either. Spread the word beforehand to make sure your most avid followers get to catch and interact with the entire broadcast. After you’ve finished, remember to save the stream to your camera roll. This is an essential step as you’ll then be able to use it to feed future content. If you hold a contest, for example, it’s a good idea to follow up with a recap video and share it across your various other social accounts. It’ll be useful to anyone who missed the stream and will help get the word out that you’re active on whichever app you’ve chosen. If you did a Q&A, consider releasing the transcript as its own piece of content on your blog. Screen grabs from the video can also be posted as stand-alone images. The point here is that a livestream remains valuable long after it’s over. How have other brands used livestreaming? Now that we’ve gone over the basics, here are a few examples of successful livestream marketing from some major brands. Hopefully this will feed your imagination so you can come up with your own creative ideas. Wendy’s found a clever way to get fans involved via livestream with their #SipMeUp campaign. For the stunt, the fast-food chain partnered up with Internet personalities Rhett & Link, who boast over 3.4 million subscribers on Youtube. Fans were directed to a Wendy’s microsite where they posed questions for the duo, after which they were connected to a live video chat and the comedy stars performed skits based on the answer. Each clip was then uploaded as a shareable video for the fans to view. All the while, a Periscope feed on Wendy’s channel showed all the goings-on backstage. It’s an interesting idea that leveraged the existing social media clout of two Youtube stars and brought it to the livestream format. It proved to be so popular that the microsite was overloaded, but that didn’t stop Wendy’s from gaining 2,700 Periscope followers and 65,000 hearts. Doritos became the first brand to host a Periscope contest in support of their limited-run Doritos Roulette chips. The Doritos Roulette product is interesting in itself – most of the chips in the bag are your typical cheese flavor, but every now and then you’ll get one that’s super spicy. To complement this idea, Doritos put together a roulette-style giveaway for their Periscope followers where they could ‘win or get burned’. Coupled with the #DoritosRoulette sweepstakes on Twitter, it became Doritos’ most successful limited-time-only promotion ever. They didn’t stop there. The brand clearly saw the platform’s potential and held another stunt to promote the release of their Habanero & Guacamole “Collision” flavor. Fans voted on objects that they’d like to see fired at each other through cannons, and Doritos livestreamed the collisions every hour for twelve hours. They then used footage from the stream to fuel a series of short ads showing the madness in all its slow-mo glory. The results were epic. Check out this clip of a laptop smashing into a watermelon, or this one where rollerskates take on a pair of milkshakes. A great example of using livestreamed video to fuel future content. It only took a day after Periscope’s release for Spotify to broadcast its first live feed on the platform. The music giant brought in Irish singer Conor O’Brien and streamed a behind-the-scenes performance for Periscope’s early adopters. The live session pulled in almost 400 viewers and over 1,500 hearts. Not bad, considering the app was essentially brand new. Spotify has gone on to stream many more live performances and currently has over 80,000 followers on Periscope. Serious social media marketers need a serious social media analytics tool. Try out Locowise’s free 7-day trial and find out what we can do for you.